1.In small skillet, toast pine nuts over medium-low heat 3 minutes or until golden brown and fragrant, stirring frequently. 2.In small bowl, stir cream cheese, Parmesan cheese and pesto. Transfer to small zip-top plastic bag; squeeze out excess air and snip off 1/4-inch from bottom corner. Makes about 2/3 cup. 3.With paring knife, starting on bottom of each tomato, cut an “X” about 3/4 way down the tomato; with small spoon, carefully scrape out pulp and seeds. Fill tomatoes with cream cheese mixture; press pine nuts into cheese mixture. 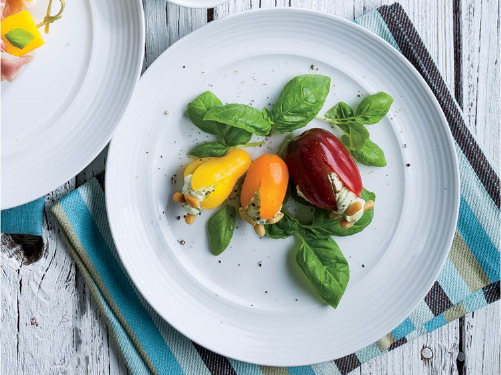 Place basil leaves on serving plate; place filled tomatoes on basil and sprinkle with pepper.